"The Strange Vitality of Custom in the International Protection of Contracts, Property, and Commerce"
Abstract: Because trade and investment laws often result from treaties, the role of custom has become concealed under a patchwork of treaty rules. Out of sight, custom is out of mind, its utility scorned. 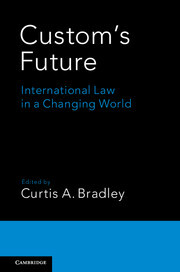 By shifting attention from law-making to international economic law’s "adjudicative aspects", this chapter intends to, first, defend custom's "weak intertwination" with treaty law, particularly in the interpretation of investment treaty clauses which protect property and contractual rights. Secondly, this chapter responds to custom's critics. It argues that (i) customary rules are as susceptible as treaties to detailed customization in their design, (ii) customary law-making can also be formed through complex trade-offs (not, simply, through "in-kind" reciprocity), and (iii) custom’s lack of predictability is overstated. This is because the same diplomatic, organizational, and institutionalized methods often used for treaty law-making are strongly intertwined with customary law-making. Contact the author for a copy.